Gift-making season is drawing to a close, so how about a little something for yourself? Now's the time to make warm winter garments and versatile layering pieces, like this cute tunic dress! Nina used New Look 6298 to make this dress. In a knit fabric, is sews up quickly and feels great to wear. Add leggings, boots, and a sweater, and you're good to go! The raglan sleeve has a shoulder dart for a smooth fit and interesting detail. Our Winter Clearance Sale continues through January 4th! Stop in for some great deals on beautiful fabrics. Treadle will be open 10-5 on Dec. 31 and closed Jan 1st & 2nd. Shop again on Jan 3rd and 4th! Our new class schedule is available now at treadleyardgoods.com/classes. We are taking registrations now for all the exciting classes listed from January through May, 2015. Don't hesitate - sign up early to reserve your spot! Register by phone at 651.698.9690, or stop by the store to register in person. OUR ANNUAL WINTER CLEARANCE SALE BEGINS FRIDAY, DECEMBER 26 WITH SAVINGS OF 20 TO 50% ON SELECTED FABRICS! Stop in and pick up something luscious for yourself, at a great discount! If you liked the faux fur featured earlier this week, you will love our new selection of faux leather and suede! First up we have this amazing blue faux leather with a subtle pearlized finish. The reverse side has a rich brown faux fur for added warmth and style! Sew up an unlined jacket or vest to show off both sides. This metallic finish faux leather will definitely stand out in a crowd! This would make a snazzy handbag or a great contrast element in a jacket. These faux suedes are buttery soft and hefty enough for coats. You can see more interesting effects in these quilted-look and distressed faux leathers. There's more in our store! Come take a look, while it lasts! We have some new faux furs at Treadle. From cuddly soft and fleecy fabrics to realistic imitations, each one is rich, thick, and delightful to touch. We have some mouthwatering new velvet colors in the store. This is not your ordinary scratchy, heavy, synthetic upholstery velvet. This luscious apparel velvet is made from drapey rayon and pure silk, with an irresistibly soft touch. Wrap yourself in luxury with a velvet dress or coat. Or combine velvet with other fabrics, such as wool or satin, for a rich textural blend. Come and see these velvets and more in person! We have everything you need for high-quality apparel sewing. We have some really fun new novelty prints from Robert Kaufman with a food theme. Food prints can be silly, fun, and just plain lovely, with illustrations like these. Food print fabrics are perfect for handmade gifts. Make kitchen aprons for all your favorite cooks! Or pajama pants that are comfy and fun. Crafts like tote bags (perfect for groceries!) oven mitts, and towels are wonderful gifts. There are a couple great panel prints with a vintage advertising feel. If beer's not your poison, how about coffee? There's so much more in our novelty print section! Come take a look. We have a group of beautiful new rayon challis prints in the store. Take a look! These prints have an incredibly soft and drapey hand, perfect for blouses and dresses. Rayon's plant-based properties make it wonderfully smooth and breathable against the skin, for effortless comfort. And with stunning prints like these, you'l look as good as you feel. Does your holiday look need a bit more sparkle? 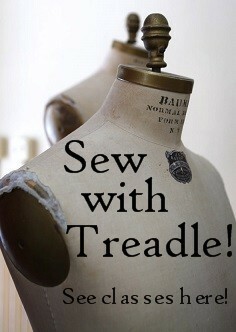 Add something dazzling from Treadle! First up we have these incredible bejeweled appliques. At 10" long, they make a seriously gorgeous impact. Add to a bodice, midriff, or headband, or anywhere you can imagine! Need to cover a bit longer area? Try a by-the-yard trim. Chain, metallic rick-rack, sequins, and rhinestones can accent hems, sleeve ends, necklines, or wherever you need a little pop. Don't overlook the buttons! Even a simple garment, or a store-bought one, can benefit from a button upgrade. We have dozens of sparkling styles. For something extra unique, try our selection of vintage buttons. Cut steel, paste jewels, and inlaid mother of pearl all add a special touch to any holiday ensemble. Add some bling to your holiday party wardrobe. We have plenty of beautiful ideas to get you started. We have some amazing new printed silks in the store. First a few sheer, transparent silks. Line these with a complementary color to add opacity, or use them as they are for layering pieces or scarves. Check out these satin "burnout" sheers. The floral design is done in an opaque satin weave on a ground of sheer silk chiffon. Even more luscious, here are a few pieces of printed silk charmeuse. Charmeuse is the slippery, drippy satin that dreams are made of, with the buttery touch you can't resist stroking. Use charmeuse for soft blouses you can layer under a cardigan, sleek party dresses, or irresistible scarves. Finally we have this shimmery, glittery silk knit jersey. All the smooth softness of silk and the easy fitting of a knit. Don't you need something new to wear the next time you dress up? Start now and you'll be ready for those holiday parties!